Speaking at AIPAC this morning, President Barack Obama reiterated his call for a "sovereign, contiguous Palestinian state" using "1967 borders with mutually-agreed upon swaps". He also claimed his comments on Thursday were "misrepresented." [My controversial remarks] discussed a border that is different than one negotiated on June 4, 1967. That is what "mutually agreed-upon swaps" means. ...The ultimate goal is two states for two peoples... Each state enjoying mutual recognition, self-determination and peace. If there is a controversy then, it's not based in substance ... I said publicly what has long-been discussed privately. Forget the '67 borders for a moment. Consider the implications of a "contiguous Palestinian state". This current map illustrates the idiocy of such a plan. 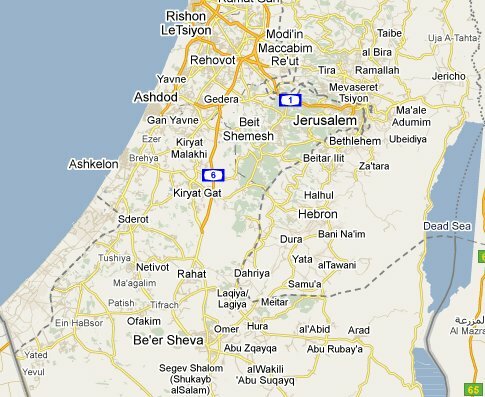 To join Gaza with the West Bank would require splitting Israel into two pieces. So President Obama just doubled-down on an absolutely nonsensical proposal. Israel tried this before: it gave Gaza to the Palestinian people. And it quickly became an armed camp, a launchpad for non-stop terror attacks. Any hope for peace with these barbaric throwbacks is delusional. There can't be peace with those who want you dead. Linked by: Gateway Pundit, Protein Wisdom, iOwnTheWorld, and Soros Matters. Thanks! Perhaps it did not work in Gaza. But that is not a reason to not keep trying. Maybe Israel could be sliced a few different ways, like a Thanksgiving turkey, at least until one of those "slices" works out. Then people could feel good having developed a model that works. So, was the fat, pony tailed Lizoid right or wrong?? I was reading another who had listened to his AIPAC address, and her perspective was that they were lukewarm and tentative. Applause when he 'raffirmed' (yeah just words from Obama) our support of Israel. Splitting Israel through the middle is probably what he wants. Anyone who listened to Obama on CSPAN will be shocked by the response from the jews in the audience. How would Americans react to an Obama proposal to return to our pre 1845 borders and ceded these terriotories to Mexico? I doubt most Americans could have been restrained much less applaud. Considering the fact that Israel was created by snatching land occupied for centuries by Palestinians who were then forcibly chased out or slaughtered in an ethnic cleansing campaign, the 1967 borders would be generous approach. If it was so just for Zionists to use terror to steal Palestinian land, why is it unjust for Palestinians to use similar tactics to reclaim the land? I'm sure it won't take too long to find a host of other things that "confuse" Uncle Cain! It's election time and threw all the manufactur¬ed controvers¬y about '67 borders he repeated the position adding all the required window dressing. But the only salient point is the '67 borders which are supported by the entire internatio¬nal community, most importantl¬y the EU where Obama just happens to be going at the moment. Now Israeli intransige¬nce will spend summer providing Obama will all the justificat¬ion required to let the September UN action move forward. All he needs to do now is watch while the fanatics in control of Israeli politics dig themselves in deep. Only a Right Wing blog would describe the occupation and sealing off of Gaza as a generous act of "giving" by Israel. I guess when you are a zionist, anything short of exterminating the Palestinians is seen as a humane and generous act. Perhaps Right Wingers and Liberals will, in some twisted way, come around to agree on the One State Solution. After all, under that propsal, Israel doesn't have to give up any land. It will just have to accept law abiding Palestinans as Israeli citizens. A pipe dream, I know. But a far less painful solution to what is being pushed forward in the current road map. The expansion of Israeli settlements were designed to prevent the Two State solution from moving forward. So bring on the One State supporters, then. Let them make their case. i just hope that the situation will entail the Israel and provide a connection between the Gaza and the West Bank.and Pres.Obama will be aware about the mideastern history.and the decision to doubled down the borders on Israel to turn to the holy land will have a good outcome.thanks for sharing this very informative post. The problem is the whole aproach to the solution is wrong. This violence and hatred is not about borders or land.It is about their religion calling for the extermination of the Jews ,if there were no more Jews than they would switch to the next 'unbeliever'just like it is happening now in Egypt.The problem is Islam and as long as Islam and the Koran are not changed there will never be peace for any other religion ,it comes down to "There can be only one"And nothing has changed in the past 1400 years and nothing will change in the future,unless you take on the root of the problem. You know, when all is said and done and in the history books, my wager for the biggest scandal of all time for the Obama administration going to have to be the foreign money he received to vault him into the White House. Sure there are the Pigford, New Black Panthers, and Gunrunner scandals, but the foreign money scandal will be the biggest. The only thing we have now is the circumstantial evidence – funds pumped into the Obama campaign for unknown sources and Obama’s conspicuous allegiance to foreign powers more than the US. But somewhere down the road we will find out where all that money came from, maybe it won’t be in time for his impeachment, but Obama’s place in the history books won’t be a good one.